Buffon (Sept. 7, 1707 – April 16, 1788) was a French naturalist, who formulated a crude theory of evolution and was the first to suggest that the earth might be older than suggested by the Bible. 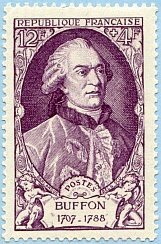 In 1739 he was appointed keeper of the Jardin du Roi, a post he occupied until his death. There he worked on a comprehensive work on natural history, for which he is remembered, Histoire naturelle, générale et particulière. He began this work in 1749, and it dominated the rest of his life. It would eventually run to 44 volumes, including quadrupeds, birds, reptiles and minerals. He proposed (1778) that the Earth was hot at its creation and, from the rate of cooling, calculated its age to be 75,000 years, with life emerging some 40,000 years ago. From Today In Science History. Stamp from HERE. More info on Buffon from UC-Berkeley.